Windows Phone 8.1 is set to be detailed later today at Microsoft’s Build conference and one of the most exciting features that Windows Phone 8.1 will bring is the Cortana voice assistant. With mere hours to go, Cortana has been listed on one of the Bing’s settings page. Microsoft hasn’t officially gone on record and confirmed Cortana as of now but this new leak surely confirms the name “Cortana”. 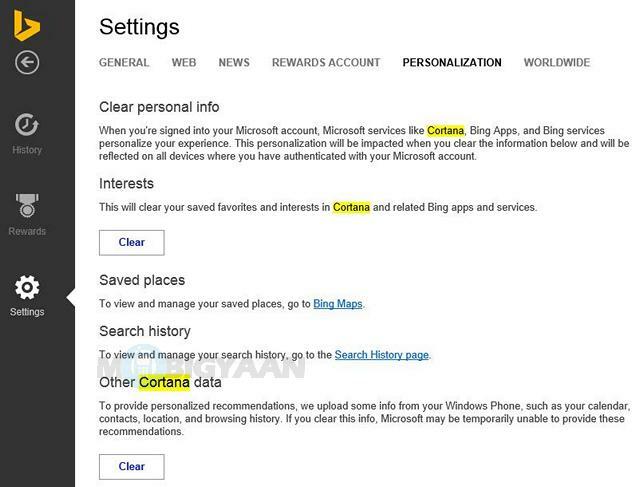 Under the Bing’s personalization settings, Cortana has been listed and mentioned. We have all known that Microsoft’s Cortana voice assistant will be powered by Bing among other services like Foursquare. The listing shows that Cortana will bring you contextual notifications by uploading data from your Windows Phone. As you can see in the screenshot, there is the ability to clear all the data that Cortana might be having. We have already seen Cortana in a leaked video, screenshots and there have been reports detailing the way Cortana will work. The leak also confirms that Cortana will let you personalize the information you would share with it. The “Notebook” feature should let you do that. Well, we won’t have to wait long to know everything about the Cortana voice assistant. Microsoft should detail the voice assistant along with Windows Phone 8.1 today. Stay tuned with us as we’ll bring you all the news from Microsoft’s Build conference.